A desire to laugh at myself and see if anybody else laughed along. And the fact that I had a rent payment due. This book has also been therapy for me. I don’t like it when I see people upset by midlife experiences, when I see the lack of appreciation of elastic waistbands, and also when I see airbrushed supermodels creating unrealistic ideals of what beauty is. Writing this book has helped me put those thoughts on paper and see that I’m not the only who thinks that way. This book is special because it made me realize that it’s okay to be myself and to write what I enjoy reading. I discovered that if I write something that appeals to me, at least I have an audience of one. I can build from there. What makes this a book that other people MUST read and WHY? People must read this or I’ll come to their houses and talk to them. Yes, be afraid. Be very afraid. It’s also a chance to laugh if you recognize yourself in any of these episodes. And isn’t that what makes life fun? Everyone in the world needs to read this book. Is that too obvious? Okay, almost everybody in the world needs to read this book. Infants can wait a few years before they pick it up. People need to read this book to help them understand friends who are going through midlife crisis, to prepare themselves for surviving it, or just to laugh at midlifers. Either way, they’ll get a laugh. Or they’ll decide they never want to sit next to me on a plane. Either one is a valuable lesson. You know what’s funny? I get creative when I get angry. I found that writing is my therapy. I remember coming home from a job interview and banging on my typewriter (yes, this was a while back) and complaining about the guy with seven strands of hair draped across his head who seemed more interested in doodling on his desk blotter than in my brilliant answers to questions. So I wrote and wrote and little by little the anger started getting really funny. I took the interview to the furthest extreme by describing the fellow as a superhero who only interviewed people in between saving the world from fast food drive-thru workers. From this experience, my humor column was born. We decide our responses to situations. Anything that makes us mad can also make us laugh. We just have to flip it and take it to the extreme. The biggest stumbling block in my writing is the attachment of my rear end to a chair. I found that the answer for me was to start with short format materials. With the attention span of an over-caffeinated gnat, it really helped to be able to sit down and write a humor column that was complete at the end of the sitting. It was those humor columns that eventually became the basis for this book. Also, try writing the worst book you can. This really helps relieve the pressure we put on ourselves when writing. Geez, even Pavarotti had to clear his throat before he sang. Plan to write a lot of phlegm before some good words sneak onto the page. People become authors because they like to be abused by editors, agents, and critics. Because they feel that performance appraisals by one boss are not enough. Instead they want their work appraised by everyone, including that crotchety woman who said that no one has written a good book since Gone With The Wind. In other words, we write because we’re insane. I became a writer because I love the thrill of creating a world and living in it while writing the story. I get depressed when the story is finished because I don’t want to leave. It’s like the darkness in the theatre when a good movie fades to black. It’s nice because you were there, but you still want more. It’s also therapy and is a heck of a lot cheaper than a psychiatrist. I was on the national radio show, The Satellite Sisters, and other various radio shows, television shows, and possibly even made it into a junior high school newspaper, but that might have just been a rumor. I’ve offered myself as a fill-in guest for any radio or TV show within driving radius on a very short turnaround time. I’ve gotten calls with “We’re taping in 30 minutes. Can you talk about something?” and I’ve done it. After the chicken suit episode, I got a reputation and ended up hosting the Harry Potter Release Party at a mall in Baton Rouge, Louisiana. Now, they’ve called me back to be Mrs. Claus and read my children’s Christmas poem to kids who’ve eaten too much candy. I’m working on a promotion idea right now to do a “mall tour” because I can create events with malls and I can shop at the same time. Sounds like heaven to me. I created a Girls Night Out group that met at a local bookstore and discussed our midlife adventures. We later moved to bars and liked it much better… although we tended to forget what we had talked about. Why are you the BEST person to write this book? What in your background or in your research makes you qualified to do justice to this topic? I hope other people will read this and say, “I could do that” and turn around and write their stories. The more of this that we share, the more we’ll all realize that we’re crazy … but at least, we’re in the same boat. Every once in a while we need to realize that there are others like us. There are other people who pretend they’re on the cell phone in the car so people in the neighboring cars won’t realize that they’re talking to themselves. Others who read the comics instead of the business section of the paper. Others who think that, if God had intended us to stay one waist size, he wouldn’t have invented elastic waistbands. This book shares those moments. It’s a great gift to remind ourselves that we’re not alone. Also, it’s not just a book for midlifers. It helps others understand midlifers. Why does the topic of your book interest you? Why would it interest potential readers? Give us a hook to reel in new readers. Do you use your exercise bike as a coat rack? Do you want to know how to look cool while searching for your car in the mall parking lot? Do you believe people on the show Survivor could never last through 39 days in your workplace? Do you believe that cheesecake and Prozac share many of the same healing qualities? Do you use the phrase, “I remember when none of that was here”? Do you list your hair color as “Number 168”? Do you believe that the birthday of Thomas Hancock, the inventor of elastic, should be a national holiday? November is National Novel Writing Month, where thousands of people worldwide will try to write a 50,000 word novel in one month. Everyone has a book in them. They just need permission to give it a shot. This is the month to do it. I’m a Municipal Liaison in Louisiana, which means that I help writers in the state coordinate events and communication during the month. I believe that one of the greatest gifts we can share is laughter. And, as an added bonus, it burns calories. 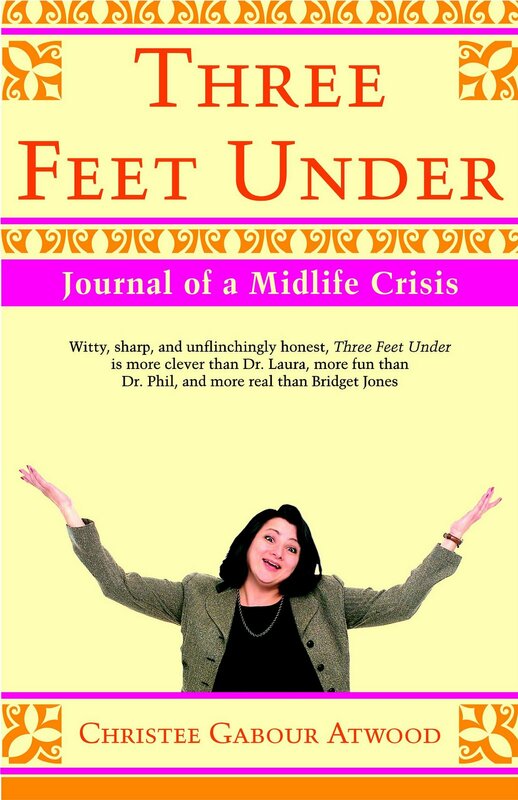 You can order Three Feet Under: Journal of a Midlife Crisis at Amazon.com or any online bookstore as well as getting at your local bookstore. If they don’t have it, please ask them to order it! You can also check out my new business and training books, Succession Planning Basics, Presentation Skills Training, and Manager Skills Training at Amazon.com.